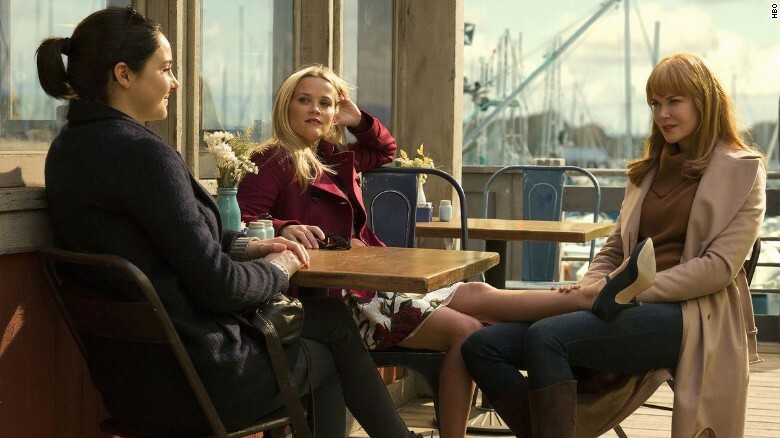 In the fullness of time, Big Little Lies will come to be regarded as one of the preeminent pieces of art of this time. It is set in present day Monterey California and primarily concerns the lives of four emotionally troubled women Madeline, Renata, Jane and Celeste. In the western slice of the geoid we inhabit the themes represented are insidious and ubiquitous. The Monterey of Big Little Lies is physically 6000 miles but psychologically cheek by jowl with the Dundrum of vetted volunteer Playstival, no running in the playground, the helicopter parent and the wet day routine. A reflection of where we are now; the premature aging of the kids and the perennial surprise and alarm of the adults at how beyond their years they are when, essentially, they have no choice. Kids take a good look at their supposed elders, establish quickly how inept and self-absorbed they are and figure that, ideally, a childhood would of course be nice but is lamentably not practical under the current circumstances. The children are relentlessly exposed to conflict and adult themes and, inexplicably, the parents seem flummoxed that the little ones seem to absorb some of it, that some of the toxicity seeps in and begins to find expression. Madeline;” I’m losing them, they’re growing up and they’ll be gone”. Madeline superficially rejects Renata and her ‘you can have it all lifestyle’ of high powered career and family but inwardly she covets every shred of it. Renata does a fantastic job exploding the myth of having it all when she threatens to bring a team of lawyers down on her kids’ school management over an innocuous playground incident. Having it all in this instance clearly doesn’t cover competent or rational parenting. So hoodwinked are all by this fantastical ideal of having it all, and seeing someone like Renata as the embodiment of it, that they can no longer see what madness this is, the escalation of a minor school playground incident into a judicial matter. All are so deep and irretrievably sucked into their own righteousness that they have relinquished the ability to evaluate anything on a rational or human level anymore. It’s hysterical or it’s nothing. This is what is at the heart of this premature growing up phenomenon. These people are so self- absorbed, self-obsessed and fundamentally unhappy that their children are merely another vehicle through which they pick fights. If they had no kids they would be arguing over parking spaces or wheelie bins. “You want to be the envy of your friends, but God forbid you garner too much of it” Madeline hates Renata because she, despite her denials, represents everything that she wants to be but can’t. To set it in Monterey is also inspired. The depiction of the town and how it has evolved into the hangout of this species, a species unrecognisable from the counter culture and jazz pioneers of long long ago. Maybe the message is that what we are seeing here is the baby steps in the evolution of a new culture, separate entirely from the mainstream just like back in the day, perhaps that is the parallel being drawn. That Monterey is the incubator for a new way of living, just like it was fifty years ago. Or is it sounding the death knell for our entire civilisation, a warning of sorts? What hope can future generations have if what is represented here becomes some sort of template for living. That western humanity continues to operate under the assumption that pretend affluence, open plan living, too much chardonnay, bottomless hand bags, dream children, nannies and high-flying careers can all co-exist quite happily. The resounding conclusion here is that they can’t and the sooner we devolve ourselves of the notion, the better for future generations. Despite all the apparent glamour what Big Little Lies does brilliantly is present a glimpse of a degenerate (dare I say dystopian) future. Combine the people represented here (now globally recognisable) with the dehumanising influence of technology and dependence thereon and what you have is a terrifying vista into the near future. And this could yet be another strand to its greatness; a degenerate vision wrapped in granite countertops, beachfront living, shimmering SUVs and apparent perfection. Dystopia through the prism of impeccable teeth, ample life insurance and retirement arrangements. Champagne squalor. At the heart of all the dysfunctionality is that having it all, the holy grail for the modern adult, is unachievable but that the message will probably never get through. We will continue to make ourselves and everyone around us unhappy in its pursuit. Embrace a simpler life, be rich or be a good parent. And grow a few tomatoes. Big Little Lies is not a horror but it’s the most frightening thing I’ve seen in years.